Measuring a stream’s level is essential for everything from flood forecasting to navigation, and has been a key duty of hydrologists for decades. A stream’s stage is its elevation compared to a fixed relative marker. This data is used for hazard reduction by helping with floodplain management and flood forecasting, recreation like determining river-sport activities, purely logistical matters like navigation, and for research by helping calibrate models for how discharge impacts river stage. The method of measuring and monitoring river stage depends on the accuracy and frequency of data required, and if the measurements are manually or automatically collected. 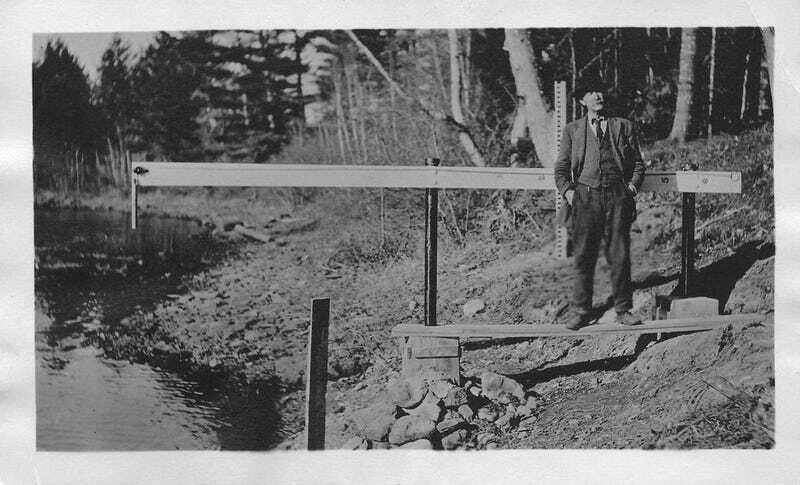 A chain gage like the one used by this USGS hydrographer in 1915 is dipped directly in the river to measure its depth. When this technique or the similar wire-weight gage isn’t feasible, a hydrologist might string a bucket over the stream, then lower a weighted measuring tape from the bucket into the water. The major disadvantage of this form of manual measurement is that the setups can be easily overwhelmed in higher stream stages during floods, and that measurement frequency depends on regular site visits. One way to mitigate infrequent visits was to use a water-sensitive substance like fluorescein or potassium permanganate in paint. Then, the paint changes colour when wet (orange to green, or black to deep purple), marking the high-water mark. Stream stage can also be measured automatically. While now this is accomplished by a variety of computerized dataloggers, the traditional technique was to attach a float to a clock with a counterweight and chain, creating a mechanical data recorder. To avoid misreadings from wave action, the float was kept contained within a stilling well connected to the stream with pipes. Alternately, a bubbler (a tube where a change in stream level increases the pressure) or ultrasonic sensor could also be used to detect the stream’s level. While the three-piece suits worn by our 1915-1920s hydrologists are certainly dapper outfits for conducting fieldwork, but is no where near as formal as the bowlers worn by hydrologists during stream gage measurements at the turn of the century.